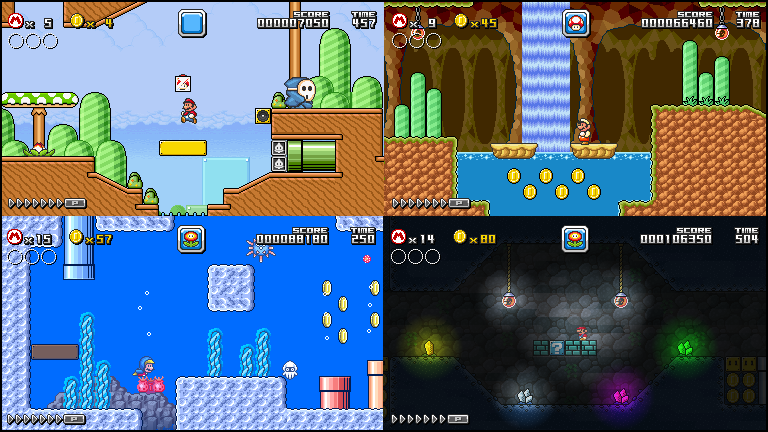 Gatete Mario Engine: Anniversary Edition is a open-source Mario Engine for Game Maker Studio 1.4 which contains features from various official 2D and 3D Mario titles. This is the result of 10 years of active engine development. 16 different powerups (Incluiding 3 never seen on any previously release of this series). Support for multiple targets. (HTML5 is not supported, sorry). 4 different Yoshi + Kuribo Shoes. Need help with the engine, no problem. Join the official Discord server to get complete support for the engine. You can also check the official GitHub repository and get a hold of the new updates made to the engine. I hope you enjoy this engine as much we enjoyed programming it. and finally, here's a handy-dandy download link. Well damn, this looks amazing. Did you actually spend 10 years on this engine alone or talking about the learning/coding you did from your past ones? (07-07-2018, 11:47 AM)PixelatedIvan Well damn, this looks amazing. Did you actually spend 10 years on this engine alone or talking about the learning/coding you did from your past ones? It is the result of 10 years programming engines, each one better than the previous one. Why did you make it 50 FPS? Other than the weird framerate, this is impressive. I like that you've implemented a lot of features I haven't seen in fangames - SMB2 logs, a properly-working Angry Sun, and Fuzzles, for example. Trouters were nice to see, too - I can only think of a couple of fangames that included those. Also, being able to freeze the Angry Sun made me smile. (07-07-2018, 07:26 PM)VinnyVideo Why did you make it 50 FPS? Never mind - it's back to normal for me. At first it was running at 50 FPS instead of 60. One bug was when you sometimes pull out a turnip, a crash error log would appear, saying that a alarm did not work right or something. Another bug is that sometimes when you die and return to the level, the world map music would still play while in a level. This is a excellent engine that you've made though. This engine still has a few bugs to fix, which I'm looking for more right now. But this engine is finished to get a topic! Version 1.4.0.3 is now available for download. If you don't want to download the newest version, you can check the GitHub repository and copy/paste the changes onto your current version of GMEA. I'm trying this bad boy out. Made wiggler not deactivate when outside the screen. @TheLemon37, care to tell me what version of the engine are you using? Version 1.4.3 has been released! However, this doesn't happen when I play it via the Game Maker project. Can you fix it? I'm honestly excited to use this! It looks amazing, and you should be proud! EDIT: Also I found that a Game Over crashes the game, but that can be fixed by turning "obj_persistent_music" to "obj_persistent"
As for the shader error, did you extracted all files? I think so. I'll try downloading it again.